National Security and Homeland Security Presidential Directive – NATIONAL SECURITY PRESIDENTIAL DIRECTIVE/NSPD 51 (HOMELAND SECURITY PRESIDENTIAL DIRECTIVE/HSPD-20) dated May 9th, 2007 directs: a comprehensive national policy on the continuity of Federal Government structures and operations and a single National Continuity Coordinator responsible for coordinating the development and implementation of Federal continuity policies. This policy establishes “National Essential Functions,” prescribes continuity requirements for all executive departments and agencies, and provides guidance for State, local, territorial, and tribal governments, and private sector organizations in order to ensure a comprehensive and integrated national continuity program that will enhance the credibility of our national security posture and enable a more rapid and effective response to and recovery from a national emergency. Federal agencies, whenever possible (such as for hurricane and tsunami exercises), should include the HPFEB in coordination when exercising their COOP emergency plans, thus allowing a link of this plan into the exercise play. This will help allow the smooth activation of the plan when a disaster threatens the State of Hawaii. Federal emergency managers can also join our Emergency Preparedness Working Group, share best practices and coordinate on continuity training and exercises. TELEWORK BY FEDERAL EMPLOYEES: Unscheduled telework is now a standard human resources tool for federal agencies. It is a product of the Telework Enhancement Act of 2010, which requires that all agencies incorporate telework into their Continuity of Operations Plans (COOP). In practice, “telework” is a work arrangement that allows an employee to perform work, during any part of regular, paid hours, at an approved alternative worksite (e.g. home, telework center). This definition of telework includes what is generally referred to as remote work, but does not include any part of work done while on official travel or mobile work. Generally speaking, there are two types of telework; 1) routine telework in which telework occurs as part of an ongoing, regular schedule and 2) situational telework that is approved on a case-by-case basis, where the hours worked were not part of a previously approved, ongoing and regular telework schedule. In general, any employee who wishes to telework (regardless of which type) must first successfully complete an interactive telework training program provided by the agency and must enter into a written agreement with his/her supervisor. No federal employee may be specifically required to telework. However, employees with approved telework agreements may be required by management to perform unscheduled telework during emergency situations. The Telework Enhancement Act of 2010 specifies roles, responsibilities and expectations for all Federal Agencies with regard to telework policies; employee eligibility and participation; program implementation; and reporting. For employees who are expected to telework when Federal offices are closed, it is imperative that they have the opportunity to telework on a regular basis to ensure that they will be able to function effectively and efficiently. For telework-ready employees, any requirements concerning the unscheduled telework option should be explicit in their telework agreements. If an agency determines that certain circumstances may require non-emergency employees to report for work or remain at work when Government operations are disrupted, the agency should establish a procedure for notifying them individually prior to the emergency. 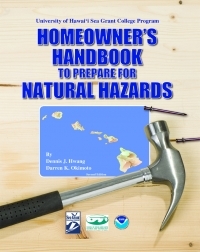 This is an outstanding resource from the University of Hawaii Sea Grant College Program for homeowners in the State of Hawaii. Click the thumbnail to download the latest version.